2019 is full of potential! It could be the year when you meet that special someone, improve your fitness, or take a spectacular vacation. Such ambitions are commendable, but it’s also okay to set goals that are a bit simpler but that will still have a big positive effect on your life. For example, making changes to improve your oral health can increase your confidence, boost your overall wellness, and grant you a big sense of accomplishment. 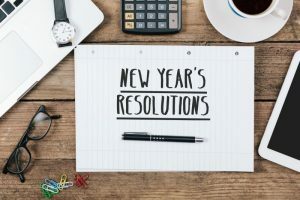 A dentist in Long Island City is here to suggest five new year’s resolutions that can help you achieve an improved smile in 2019. If it has been longer than six months since your last dental checkup, now is the perfect time to schedule an appointment. A professional cleaning will help your mouth feel fresh, and the exam will alert you to any new dental problems that you need to address. Plus, the advice you get from your dentist and hygienist can give you the motivation and knowledge you need to reach your other oral health goals for this year. Your toothbrush cannot thoroughly clean the tight spaces between your teeth; that is why flossing is so important. If you frequently forget to floss, you can set a daily reminder on your phone. Or, you can set your floss somewhere it’s easy to see so it serves as a visual reminder of what you need to do. Did you know that the average American consumes almost 60 pounds of added sugar each year? Cutting back on the sweet stuff will decrease your risk of tooth decay and benefit your overall health. Doing something as simple as cutting soda out of your diet or taming your dessert habit can drastically reduce your sugar intake. Also be sure to scrutinize food labels; many foods that are advertised as being healthy contain a lot more sugar than you might expect. Consider replacing the sugar-loaded snacks in your diet with foods that are good for your smile. For example, apples and other fiber-rich foods are fantastic because they help to clean the gums. Dairy products contain calcium that can fortify your teeth. Green and black teas have polyphenols that fight harmful bacteria. Smoking is one of the worst things you can do for your oral health. It doubles the risk of gum disease, stains the teeth, contributes to bad breath, and can harm your senses of taste and smell. Work with your doctor to create a plan to kick the habit, enlist the support of your family members and friends, and set a “quit date” that will mark the state of your new, tobacco-free life. Do you want to improve your oral health in 2019? Use the above suggestions to make this a fantastic year for your smile. Dr. Ishwinder Saran graduated from the Boston University Goldman School of Dental Medicine. He is a highly skilled, highly experienced general dentist who offers preventive, restorative, and cosmetic services to the Long Island City community. If you would like his help to achieve a healthier smile in 2019, contact our office at 718-530-6539.